I mounted the Leupold DeltaPoint Pro Rear Co-Witness Iron Sight system with the Dueck Defense Red dot Backup Sights on my tier 1 salient Glock 17 the other day and shot it for the first time in this video. It was remarkably easy and it feels like I’m falling in love all over again. It’s literally like I have an entire new weapon system altogether. The Duke defense mounting system is definitely my favorite because I did not have to cut into my salient slide. 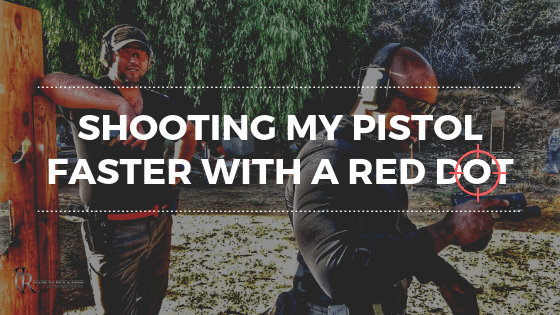 Additionally having iron sights to co-witness with my red dot is extremely helpful in helping me acquire the dot much faster and much more efficiently because all I have to do is line up my sites as usual. Upon my first exposure to this way of shooting I’m finding that I really like it a lot because there is much less work to be done when achieving sight alignment and site picture. There are fewer components to line up, all I need to do is put the dot on top of the target where I would like to place my round and as long as I can execute a decent trigger pull, I am pretty much where I want to be. I don’t think I’m faster with my optic that I am with iron sites yet but I can see how this way of shooting will be more efficient for me once I really begin to understand all of the competencies involved with it. Beyond that what makes this video special to me is simply the fact that I learned about shooting cadence and it helped make me get faster right in front of the camera. Luke Agajanian is a good friend and has contributed heavily towards my evolution as a shooter and he helps me take my game to the next level in the video. By the end of the video I’m shaving some serious time off of my evolution of fire by paying attention to cadence more and getting sucked into each target less. I will not say whether or not I think that this style of shooting is necessarily tactical or not. I would argue that it’s better to know how to do things like this rather than not be acquainted with methods that can make you do anything a number of different ways in order to answer any occasion. CHECK IT OUT! For my discount with Dueck Defense (https://dueckdefense.com) use my coupon code “BYRON” when checking out online when checking out online.